Subject: Two articles authored by a “tobacco”control”” researcher (Sa’ed Zyoud) involved in a nationwide religious ban (“fatwa”) in Malaysia have been published in the Harm Reduction Journal and Tobacco Induced Diseases one (BioMed Central group). The author has never declared such a serious conflict of interest, therefore violating the so-called ethical code of conduct of the two journals and the editorial group they represent. Double standards: It appears that when it comes to the oriental pipe, anything is permitted. If the matter had related to the cigarette, cigar or even the E-cigarette, no doubt that this would never have happened. Zyoud’s et al bibliometric analysis of tobacco-related publications in the Middle East (2003-2012) poses a serious ethical problem and contains noticeable methodological errors . The performed analysis has no direct relation with tobacco harm reduction. On the contrary, its authors hype a series of risks in line with the prohibition agenda set by so-called FCTC (Framework Convention for “Tobacco “Control””) whose implementation was actually delayed because of so-called “old and new” epidemics” (sic) originating in the Middle East . 1-Undeclared conflict of interest with religious institution.Two of the authors are affiliated with a Malaysian university involved in a Fatwa (this is a religious ruling in Islam) which has recently banned one typical Middle East form of tobacco smoking . The “WHO Collaborating Centres”, to which the authors also work with, are also known for regularly lobbying national religious leaders in Muslim countries in order to get such Fatwas issued. Copies of such cases of scientific/public health misconduct case are available for countries like Egypt and Libya. We believe that as far as tobacco issues are concerned (and global confusion has remained their key characteristic of the past decade), religion is one thing and Science another one (see ANNEX for full details). 2-Epidemic Definition Revisited. The authors redefine the very concept of “epidemic”. According to such novel interpretations, it would have taken some 400 years at least to realise that an ancient cultural daily practice of Asian and African societies would have suddenly become an “epidemic” and, more than that, a global one (see ANNEX for full details). 3-Middle East Space and Time Revisited. The authors have labelled as “Middle Eastern Arab” (sic) publications actually produced by US institutions (Virginia Commonwealth University, University of Memphis, University of Florida). The so-called US-Syrian Centre in Aleppo (North of Syria) has always been managed, exclusively, from the US territory and by US principal investigators (i.e. those drafting the manuscripts reviewed in the authors’ paper). Furthermore, a fair number of the so-called reviewed papers relates to “studies” carried out in the US, not in the Middle East itself. For reasons of space, we will not discuss here the unethical case of the US-AUB (US-American University of Beirut). Finally, since Iran and Turkey, known for their substantial publications record, have been brushed aside for no given reason, the objective of the “bibliometric analysis” remains quite suspect. Its objective is clearly to highlight the activity of the above antismoking centres managed from a distance by US researchers based in the USA, not Middle East research done by Middle East researchers. In this respect, the covered period of time is anything but dubious: “2003-2012” given that the related (prohibition-oriented) activity of the above-mentioned centres began in 2002. The Head of the US-Syrian antismoking centre even went so far as declaring to the media that “Hookah research began [only] in 2002” (sic), i.e. making tabula rasa of decades of quality independent (from both the tobacco and pharmaceutical industry) research on the Middle East method of smoking, now is of high concern to because it represents an economic competitor to both cigarettes (tobacco industry) and nicotine “replacement” medicines (pharmaceutical industry). 4–Over-citing and “Bibliometrics”. Based on the above, it appears that most tables to be found within the authors’ article are flawed. However, there are things of even greater concern. 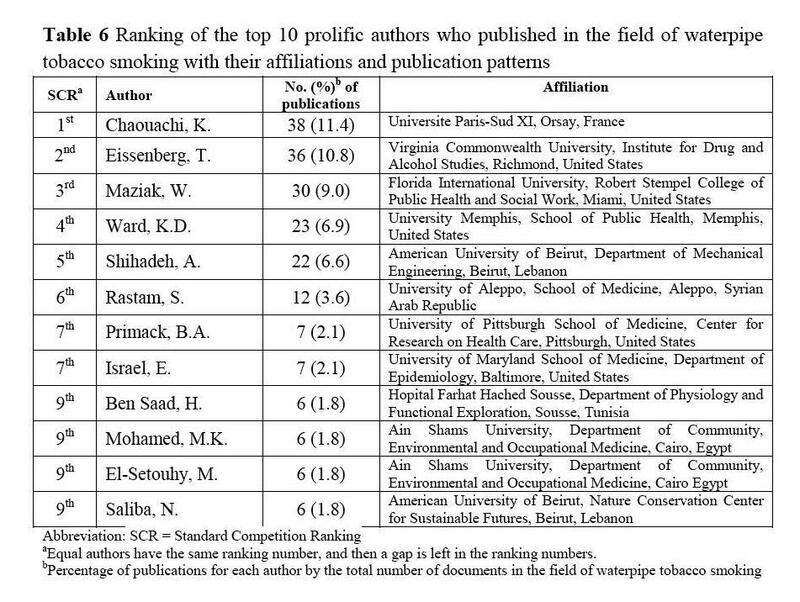 Please consider its Table 3, for instance, which shows how a completely flawed and erroneous 2004 “review” by the US-SCTS (titled “Tobacco smoking using a waterpipe: A reemerging strain in a global epidemic – Tobacco Control”), actually ranks 2nd in the “Top-Ten tobacco related cited articles from 13 MEA countries in Scopus”. That “review” actually contains a long series of serious errors. For instance, it stated that hookah caused aspergillosis whereas the patient in the corresponding study did not change the water of his pipe for weeks. It credited authors of past cancer studies for the exact opposite of their findings . Zyoud et al found that such a “review” has been cited up 179 times in the ««waterpipe»» antismoking literature. However, the peer-reviewers did not realise that this reflects only one thing: the “snowball effect” caused by all those (antismoking) researchers across the world who believed that it was a “good” “scientific” reference and cited it. One could compare this flaw with the one occurring during fraudulent elections when ballot boxes are jammed to favour one given candidate. For instance, who can believe that a peer-reviewed study, published in a European public health journal, cites the US-Syrian Centre for Tobacco papers up to 80 times in a manuscript of only 6 pages, and that 64 of such citations concern the Head of the US-Syrian Centre himself, and that it appears up to 22 times in the first two paragraphs ? In the first two paragraphs, Maziak is cited 18 times and likely 22 times due to citation confusion with “Asfar et al. 2004a, b, c, d” which apparently refers to the same author. One may cite a totally pseudo-scientific article 1 million times. However, what does it demonstrate ? Author of 63 peer-reviewed publications on this issue, totally invisible in your author’s publication, although all dealing with tobacco issues and the Middle East. Among them, and not the less relevant here, the most popular one in the Harm Reduction Journal itself with about 150,000 views so far (related to its site only). Chaouachi K. False positive result in study on hookah smoking and cancer in Kashmir: measuring risk of poor hygiene is not the same as measuring risk of inhaling water filtered tobacco smoke all over the world. Br J Cancer. 2013 Apr 2;108(6):1389-90. doi: 10.1038/bjc.2013.98. Epub 2013 Mar 7. A paper shattering, in only 1000 words, one full decade of pseudoscientific claims and unethical methods regarding the so-called toxicity of the Middle East way of smoking. Al-Safi SA, Ayoub NM, Albalas MA, Al-Doghim I, Aboul-Enein FH. Does shisha smoking affect blood pressure and heart rate ? J Public Health 2009; 17:121–126. West R, McIlwaine A. What do citation counts count for in the field of addiction? An empirical evaluation of citation counts and their link with peer ratings of quality. Addiction 2002; 97:501–4. Zyoud SH, Al-Jabi SW, Sweileh WM. Bibliometric analysis of scientific publications on waterpipe (narghile, shisha, hookah) tobacco smoking during the period 2003-2012. Tob Induc Dis. 2014 Apr 13;12(1):7. doi: 10.1186/1617-9625-12-7.